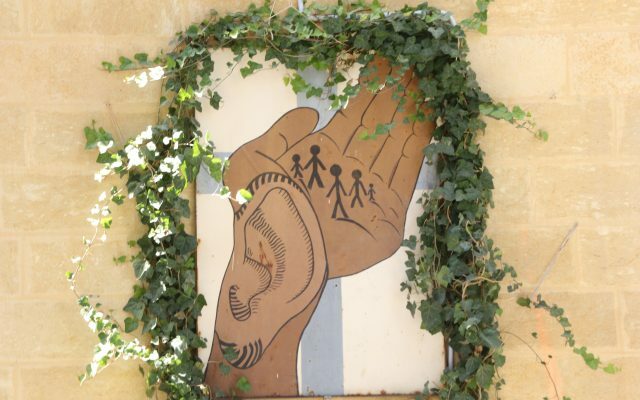 On Sunday 23 September, in between renewing our Baptism vows in the river Jordan and swimming in the Dead Sea, we visited the Holy Land Institute for the Deaf in the old Jordanian capital of Salt. I planned to stay for an hour and a bit; we actually stayed 3½ hours and made Salt one of the highlights of a wonderful pilgrimage through Jordan. Why ‘Three Musketeers’? On most ‘living stones’ visits one hardly expects to see the driver and guide – they can take time off. But at this wonderful Anglican institution not only did our guide (Zaid) and our driver (Ibrahim) join us in playing football with deaf children and ‘enjoy’ our school dinner; but our tourist policeman (Mohammad) even helped me and other men in the party with the washing up – he didn’t want us to tell his wife, who had never seen him in a kitchen. Our visit started in the chapel, with a talk by Father Wadie Al-Far, their brand new priest. I was very impressed how quickly he had learned about communication with deaf and deaf-blind people – he was a real inspiration. After our simple school dinner (which was amazingly loud surrounded by chattering children who didn’t know how loud they were) we split into groups for guided tours of the Institute – seeing classrooms, bedrooms and even a factory – deaf and deaf-blind children will often not complete their education until their mid-20s – but by that time they may have learned to make tables and chairs and playground equipment, let alone how to communicate and count. For me, for whom this was my third visit, I had a lesson in patience – not so much waiting 3½ hours for people to savour the place, but watching a teacher being hands-on with a deaf-blind girl of about 4; she reckoned she had a full-time job with this child for the next 20 or more years; and then the girl would be ready to live a productive and independent life in the community. This teacher had done it all once before – we met a lovely deaf-blind man of 29, who had been taught by the same lady for most of his life. Fantastic. If you can’t get to Salt on a Jordan pilgrimage (I intend to go back in 2020) but would like to know more, then look at this website and Facebook page.